TracFone has launched a new CDMA BYOP program that lets you activate Verizon phones on the pay as you go service. Tracfone BYOP (Bring Your Own Phone) is limited to a subset of older Verizon phones. The iPhone 4 and 4S are allowed but BlackBerrys aren't and neither are LTE-capable phones, which eliminates all Verizon smartphones released in the last couple of years. BYOP uses the same "triple-triple" billing system as TracFone's recently introduced Android phones. The way it works is that a $19.99 "60 minutes" refill gives you 180 minutes, plus 180 texts plus 180 MB of data good for 90 days. When you add more money unused minutes, texts and data "roll over" and get added to the total available for the new plan period. Triple-triple is quite a deal, especially for data, when compared with TracFone's older feature phones which only tracked minutes and deducted 1.5 minutes for every KB of data used. With triple-triple, assuming you could use all three buckets at an equal rate, the per unit price of a minute, text or MB of data ranges from 3.7ċ with the $19.99 60 minute card to 2¢ with the $79.99 450 minute card. The only downsides to triple-triple are that unlike with TracFone's own non-smartphones, there's no roaming and it's not a very good deal or users who mainly use text messaging rather than voice calling or data. To activate a Verizon phone on TracFone go to tracfonewireless.com/byop/ where you will be asked enter the phone's MEID serial number. If the phone qualifies based on the MEID you get to purchase a $9.99 "Network Access Code" which allows you to active your phone online. 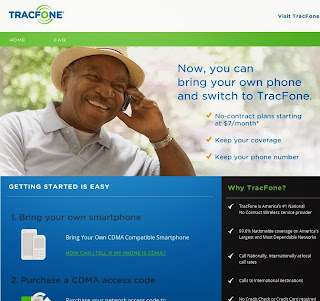 Updated 03/07/204: TracFone's BYOP site now says they can activate the iPhone 4 and 4S. TracFone would give you an extra 500 sms. I did the bop with a Droid x2 from Verizon. I've had constant problems. The tracfone app won't work. All of my data was used even though wifi was on and the activation codes won't go through but I can make phone calls. Get out your WebOS phones. They accepted the MEID for a Palm Pixi Plus and Pre 2 all the way to paying for the Access Code. but the battery life is so bad. I have a unopened Pre 2 GSM. My Vzw pixi plus and pre 2 have OEM batteries that last a long time. Maybe you got a bad one. Very light users of TracFone pay $5/more per year than Selectel, and get only 60 minutes and sms/month vs. 166 and 125. These TracFone users get 60mb of data per month, though, compared to only ~8mb/month on Selectel for the same $80/year. Saving ~$31/year for the extra 620mb. 200x3x3, plus 60x3 = 1980 minutes for $140. In practice, it could cost a little less than an average of $140-150 over time with TracFone because rollover lets you choose to pay less per minute with the more expensive cards. Minimizing cost over time with TracFone can be a little harder, but you do have more refill choices. I love tracfone smartphone plan. You can buy a 1 year card for $99, you get 1200 minutes, text, 1.2GB of data. I might get and old Samsung Fascinate or a Motorola Droid X to use. BTW. Tracfone sells 1 year cards with 1000 units on their website for $160. That's 3GB of data with 3000 minutes and texts. IT sounds like the same phone restrictions as other Verizon MVNOs but no mention of Verizon prepaid phones. Does anyone know if you can activate a Verizon prepaid phone on this plan? Thanks. I just tried a Verizon Prepaid Motorola RAZR V3m ESN and got an error. TracFone has no problem accepting my Sprint Moto Krazr K1m DEC, which worked fine on PagePlus (locked in roaming, as Dennis suggested). Do phones from other MVNOs (like Virgin Mobile or Boost) work with the BYOP program? They aren't supposed to but you can try. Also, if you get a Sprint based phone like Virgin and Boost past TracFone's MEID checker it would need to be flashed to work on Verizon based TracFone. Dennis. What does locked in roaming mean. Will your data, text work. On Pageplus, I set up the Sprint Moto phone to ALWAYS roam on Verizon. That way, I did not have to pay the Pageplus 29c/minute roaming charge (IE, roaming from the Sprint network default settings on my phone). This Moto has not been flashed to Vzw, so data does not work. Text works. Some other Sprint phones also have the setting to force roaming, but none of my Sanyo phones do. The BYOP site says no. I don't know if this rule is actually enforced however. I was able to activate a new HTC Rhyme last friday. Took 3 days and many hrs on the phone and a bunch of emails. Applied 200 min. card and it did triple. Could not transfer phone number but did transfer 4000 minutes into the 4k minutes, 4k texts, and 4 gb data. Also, 2 yrs of service. That is the good news, the bad news is I have been trying for the last 3 days to get the 2nd Rhyme I purchased at the same time activated...no joy. It is not eligible. Go figure! The vast majority of their CS reps don't have a clue about the BYOP program. I agree. I've spent countless hours on the phone with cs and it just keeps getting worse. I have a Droid x2 from Verizon. The app to check my min&data won't work. Tried it with 2cs browsers. All my data disappeared with wifi on. The activation code won't go through but I can make calls. I had 3800 min and they gave me over 6000 min 1600 text & 1.58 data. Does this make sense? I have the same problem but the 1.58 data is in fact 1.58 GB even though it shows MB in the text. Use TF website to verify this. The app does not work well on the byop phones. For those of you who have been able to activate your phones, what are the texting rates? Is it .3 units per text or one, like the android phones now offered by TracFone? I'm debating this or possibly Selected or PagePlus. As explained in the post, BYOP is the billed the same as TracFone Android phones. There are separate voice, text and data buckets. A $19.99 "60 minutes" refill gives you 180 minutes, plus 180 texts plus 180 MB of data good for 90 days. It's probably the case that only very old 3g android phones are working.. TF has not been clear on what phone models DO work. This is not the way TF usually rolls out new features & service half-assed. IMO, they should just skip minutes and offer all 3g phones an unlimited talk/text/data for $25 a month (with limited throttling of data to ensure fair & equal access among the towers in a given area, not to force a $50 upsell). It really doesn't have much to do with model, it is all about the MEID. Tracfone is sending the MEID to Verizon. They determine whether to grant access or not. As long as the phone is a Verizon phone, CDMA only, 3G non LTE, the model should qualify. The MEID is the kicker. It must be in the Verizon database. Which means it has to have been active at one time. But, it must also be "clean." The definition of what clean is can be a bunch of things. Like it can't: be a return, purchased on a promo, be from an unpaid account and a half dozen other reasons. Tracfone is at the mercy of Verizon on this thing and Verizon does not return error codes that give TF enough information to tell you why your phone won't activate, so, they post some bogus, generic error message. I gleaned all of this from about 8 hrs on the phone with the most Sr. CS people at Tracfone. It would be better to push into the $25 a month unlimited talk/text/3g data offerings metro/tmobile offers on a BYOP basis (plus the $10 activation). Also, get a better database of compatible phones!! Do you have to have a monthly plan or could you just buy store cards like all the other Tracfone phones. Either, any Tracfone plan or refill card can be used with BYOP phones. Just bought a prepaid Verizon Moto G for $99. Tried to get it to work on Tracfone and I can't get past "The MEID/Serial Number you entered is not recognized as a compatible phone for the purpose of this Registration process". Any way I can get this to work? This would be awesome on Tracfone. I use little to no minutes and most of my data I use is Wi-Fi. I agree that a Moto G on Tracfone (or PagePlus, or BYO, or Selectel, etc.) would be wonderful, but your subsidized Verizon phone isn't going to be accepted since it's all up to Verizon whether to allow it on their network. I hope that some day soon we will be able to purchase (at full price) a CDMA version of the Moto G that's not tied to a carrier, so that we can take it to a Verizon MVNO. I don't know if that day will ever come. I wait. I watch. I hope. I got the Moto Droid X2 to transfer from my Tracfone ZTE Valet harmlessly on 1/16. The droid was a refurbish off ebay. Couldn't deal with the crappy androids TF offers. Everything seems to work well. which ebay seller did you buy the phone from? most of the ebay seller when asked about its activation on Tracfone either refuse to answer or say NO. currently have a ZTE Valet (HSN) on Tracfone phone is acceptable, but I'd like to get just a better phone. Don't use a whole lot of minutes or data so the TF plan works well for me. Thinking of a refurbished Moto Droid X2 as a replacement. Does anyone know if my current minutes and number will port over. The Tracfone BYOP is still not very robust. Tracfone is supposed to be able to transfer your number and balance to a BYOP but several users have reported problems with the process. There have been two issues. Sometimes a BYOP phone won't activate as part of a transfer but actives fine on a new number. 1. not all droid x2 phones will work with the byop service - so your ability to activate it implies you have a clean device. 2. TF rep told me I could transfer only my number if I was yet to activate the droid x2. But when he saw that it was already activated, he told me I could transfer both number and balance. TF will assign your droid x2 a new meid number when you activate it. This number is different from the one you see on your phone. You can see this number if you go to your TF account on their website. Use this number as your meid when porting your zte valet number and balance as you will have a smooth process. You may not even need to call TF customer representative. Just transferred my old tracfone number to a Motorola Droid X. The new phone doesn't show my account info, so I will monitor my account online for now. Contact free moto g is out! Does any one think it'll work with track done byop? It won't work. Only Verizon postpaid phones can be activated on TracFone. The Verizon Moto G is a prepaid-only phone. The unlocked Moto G is GSM only. The unlocked Moto X doesn't work on Verizon postpaid and is an LTE phone so it can't be activated on TracFone either. um.. guys its changed again.. now accepting iphone 4/4s. Here's why. The 3g and 3gs are gsm. Thanks, I've updated the post to indicate that Tracfone now says they can activate the iPhone 4 and 4S. Have you successfully activated one? I tried the TracFone BYOP program without success. I think it is because my iPhone4 is still LOCKED to Verizon and it was never "activated" I'm not sure what to do. I've talked with tracfone- they said everything worked on their side-I just need to have access to Cellphone Service for my phone to work. I called Apple Store- They said the phone needed to be UNLOCKED. I've been to the local Verizon shop and they informed me that they are unable to UNLOCK my phone. Did you buy a prepaid iPh4? That will not work on Tracfone. If it is a regular Verizon 4, it should work. There is nothing to unlock on the 4; there is no SIM card slot, and you are activating it on Verizon via Tracfone. If you cannot activate the phone for the first time on Tracfone, activate it on Pageplus, then do an ESN swap with another Vzw phone or an ESN release to free up your iPhone for use on Tracfone. I'd like to put a HTC Trophy windows phone on Tracfone BYOP. By entering the ESN it appears that Tracfone would accept it, but what about their "Android only" policy on the data cards on the Airtime page? Has anyone been successful with a Windows phone on BYOP? I successfully got my HTC Trophy to work in February and it hasn't had any problems. Just activated an Iphone 4S I bought on Ebay. Works well, although they did charge my card 12 times for the network access fee. Bank has filed a claim on the excess charges as Tracfone says they only charged it once. All minutes/text/data transferred. You can see them on the TracFone Website if you create an account. Aren't the text messages from TracFone free? Verify your minutes/text/data before you transfer your Tracfone to BYOP. I had 4609/4838/4964.4 on my old Tracfone. After the transfer I only had 1179/1195/1199.7. That's like losing $300 or 3-400 min cards. Tranfone says that's all their computers show even though I checked right before the transfer. Suggest you transfer by phone and verify that you will get all your minutes before you transfer.